In the light of recent events in Palestine, it is interesting to note that a dispute over the control of the Church of the Nativity in Bethlehem was one of the immediate causes of the Crimean War of 1854–6. In the summer of 1850 Orthodox and Roman Catholic monks clashed over the question of who should control the church, several Orthodox monks being killed as a result. Tsar Nicholas demanded to be appointed the protector of all Christians in the Ottoman Empire, a demand to which the sultan could not, of course, accede. By July 1853 Russia had invaded Turkey’s Danubian principalities (Moldavia and Wallachia), and France and Britain, fearing Russian control of the eastern end of the Mediterranean and also further expansion into their own territories in North Africa and India, promised to go to the aid of Turkey. After the failure of diplomatic efforts, France and Britain declared war on Russia on 28 March 1854, Turkey joining the Anglo-French alliance on 10 April. In January 1855 Sardinia-Piedmont joined the war on the allied side and, while the conflict was centred on the Crimean peninsula in the Black Sea, there was further fighting in the Baltic and naval activity in the Atlantic and the Pacific. Indeed, many Crimean historians now argue that the Crimean War was the first ‘world war’, while the trench fighting around Sevastapol foreshadowed later events in World War I. What was the impact of this European war on Ireland? One could well imagine that Ireland, just a few years after the Famine and the failed Young Ireland rebellion of 1848, would regard the war with a sense of sullen disinterest. Newspaper accounts of the period, however, suggest the contrary. In the early months of 1854 Ireland was gripped by a kind of war fever as regiments departed and young men rushed to join up to fight in a war which, it was assumed, would be over in a few months. Indeed, in scenes that mirrored later events in 1914, public enthusiasm bordered on hysteria as the troops left for the east. Lieutenant-General Sir George de Lacy Evans, from Moig, County Limerick, distinguished himself at the battles of the Alma and Inkerman. This public interest in the regiments departing for the war is perhaps not surprising when one considers the large number of Irishmen who were serving in the British army at this time. Irish soldiers made up around 30–35 per cent of the British army in 1854, and it is estimated that over 30,000 Irish soldiers served in the Crimea. There were some prominent men among them. General Sir George De Lacy Evans, from Moig in County Limerick, and General Sir John Lysaght Pennefather, from County Tipperary, both distinguished themselves at the battles of the Alma and Inkerman. Irish-born soldiers and seamen won 28 Victoria Crosses. Master’s mate Charles Davis Lucas, from Poyntzpass in County Armagh, was awarded the first-ever Victoria Cross for throwing overboard a live shell that landed on the deck of HMS Hecla during a bombardment of the Bomarsund fortress in the Baltic in June 1854. Alongside this Irish involvement in the military, there was a large Irish civilian contingent in the Crimea. In the years following the Napoleonic wars the British government had run down the army medical and supply services. On the outbreak of the war a call was made for volunteers for both the supply service (the Commissariat) and the medical services. Several Irish doctors volunteered to work in the hospitals at Scutari and Balaclava, where Irish nurses and nursing sisters also worked. There was a total lack of Roman Catholic chaplains, and several priests—including two Dublin-based Jesuits, Father William Ronan and Father Patrick Duffy—volunteered to serve in the Crimea. 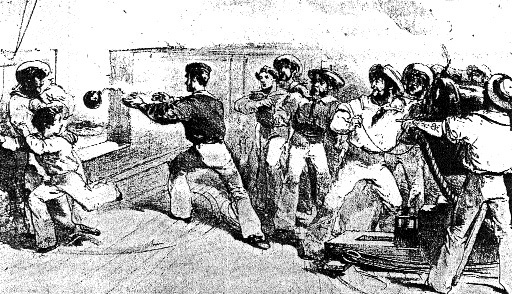 Contemporary illustration of Charles Davis Lucas, from Poyntzpass, County Armagh, throwing overboard a live shell that landed on the deck of HMS Hecla during a bombardment of the Bomarsund fortress in the Baltic in June 1854, for which he was awarded the first-ever Victoria Cross. Irish engineers and navvies also worked on the new roads and the railway in the Crimea. The chief engineers of both the road and railway projects, William Doyne and James Beatty, were Irish. The weather, as yet, is not colder than in Ireland, but when a man gets wet to the skin, he has no place to go to but a cold tent; and when he gets up in the morning he must go about collecting wood to boil his breakfast; which consists of green coffee, which must be roasted on the stable shovel, pounded and thrown into the water; that, with some biscuit, is our breakfast; biscuit and salt beef for dinner; and supper same as breakfast. We get two glasses of rum every day, which is chiefly the thing that keeps life in us, but we hope it won’t be always as bad as it is now. If Sevastapol was once taken our condition would be better. Why, if it is not taken, and that the troops have to winter here, history will record another 1812. Some of the Mounted Staff Corps are in excellent health and spirits and we hope, with the Divine assistance, to rub out and return to our native country again. We marched on up to Devna and remained for a fortnight. There I bought a little wash tub, and carried my cooking things in it. This was the whole of my baggage which I carried on my head during the march. I also had a water bottle and a haversack to carry biscuits in. The priest and minister had to carry their own bottles and sacks, like the soldiers. On the march the men kept falling out from the heat and they kept me busy giving them drinks. When we got to Monastne the [washing] duty of No. 5 Company fell to me; there were 101 in it and the clothes were brought by its transport horse. I stood in the midst of the stream from 6 am to 7 pm washing. The Colour Sergeant would not keep account and some men paid and some did not, so that I was left with very little for my trouble. The management is infamous and the contrast offered by our proceedings to the conduct of the French most painful. Could you believe it: the sick have not a bed to lie upon? They are landed and thrown into a rickety hut without a chair or a table in it. The French with their ambulances, excellent commissariat staff and boulangerie etc., in every respect are immeasurably our superiors. While these things go on, Sir George Brown only seems anxious about the men being clean-shaved, their necks well stiffened and waist belts tight. 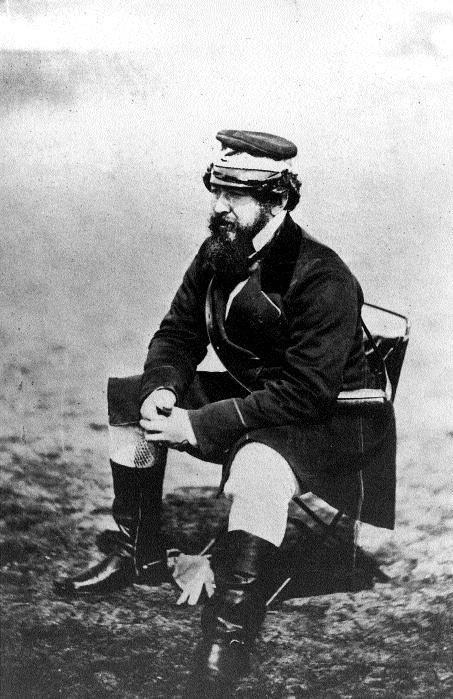 For the first time the public was given regular information about the management—or, in this case, mismanagement—of a war, and Russell’s despatches served to destroy the reputation of the British commander, Lord Raglan, while also playing a part in the fall of Lord Aberdeen’s administration in January 1855. Only a small number of war correspondents worked in the Crimea, and it is interesting to note that there were two other Irishmen among them—Edwin Lawrence Godkin, born at Moyne, Co. Wicklow, and James Carlile McCoan, born in Dunlow, Co. Tyrone. Both Godkin and McCoan wrote for the Daily News. In view of this high level of Irish involvement in the Crimea, in both the military and civilian capacities, the intense interest of the Irish public in the war is perhaps less surprising. Many families must have had members in the Crimea serving in some capacity. The work of war correspondents such as William Howard Russell fed this public demand for information, and the large number of Crimean War ballads in Irish collections is a further manifestation of this interest. When the south side of Sevastapol was captured in September 1855 a series of celebrations took place around the country, and these were repeated when an armistice was signed in Paris in February 1856. William Howard Russell, Dublin-born London Times correspondent, photographed in the Crimea by Roger Fenton. 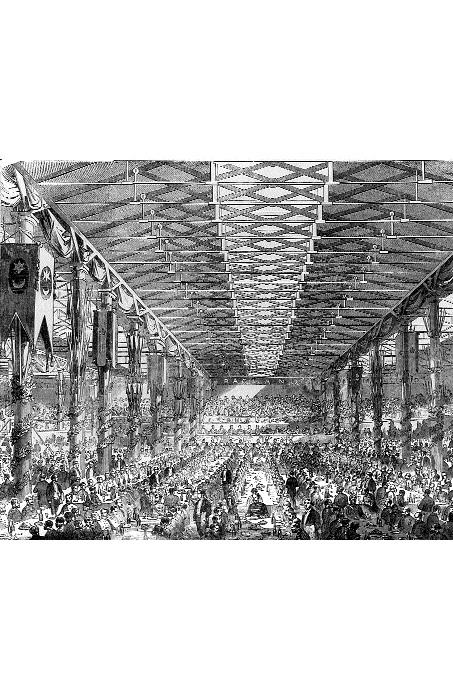 Perhaps the most extravagant demonstration of the Irish public’s enthusiasm for the war was the Grand Crimean Banquet held in Dublin in 1856. Over £3600 was raised by public subscription, and 4000 Crimean veterans and 1000 members of the public gathered in Stack A in the Custom House Docks on 22 October 1856 for what must surely have been the largest-ever formal dinner in Ireland. Three tons of hot potatoes were sent in four vans, which pulled up to the hall ‘steaming like locomotives’. The drivers of these vans were ‘literally enveloped in clouds of steam’, much to the delight of the small children who were looking on. A vast amount of food and drink was consumed, including 250 hams, 230 legs of mutton, 500 meat pies, 100 venison pasties, 100 rice puddings, 260 plum puddings, 200 turkeys, 200 geese, 250 joints of beef, 100 capons and chickens, and 2000 two-pound loaves. Each soldier was given a quart of porter and a pint of port or sherry. Such a conspicuous display seems incredible when one considers that just ten years previously Ireland was being ravaged by famine. There are also physical reminders of the war in Ireland in the shape of monuments and even Russian trophy guns, such as the cannons on the steps of the courthouse in Tralee, on the pier in Dun Laoghaire and on the Armaghdown Bridge in Newry. Yet despite the public enthusiasm displayed, the Crimean War has been largely overlooked by Irish historians. Usually just remembered for events such as the charge of the Light Brigade and the work of Florence Nightingale, the war was, without doubt, one of the major episodes in Irish history in the mid-nineteenth century. Not only was there a high level of Irish involvement, but the work of the Irish-born correspondents ensured that the public was fully informed of events in the Crimea. While the end of the war was hailed by the government as a great victory, the public was now fully aware of the inadequacies of the army’s commanders and organisation. The majority of the British army’s 21,097 fatal casualties had succumbed to disease, only 4774 being killed in action or dying of their wounds. Irish names feature prominently on the casualty lists, and the Irish public must have come to realise that most of these deaths could have been avoided. 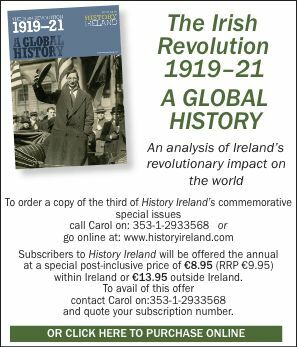 Towards the end of the war newspaper reports in Ireland began to sound more war-weary, and it became increasingly obvious that thousands of Irishmen had paid for the army’s lack of organisation with their lives. David Murphy is an editorial assistant with the Dictionary of Irish Biography, Royal Irish Academy. E. Bolster, The Irish Sisters of Mercy in the Crimean War (Cork, 1964). A. Hankinson, Man of Wars: William Howard Russell of The Times (London, 1982). D. Murphy, Ireland and the Crimean War (Dublin, 2002). T. Royle, Crimea: the Great Crimean War, 1854–1856 (London, 1999).